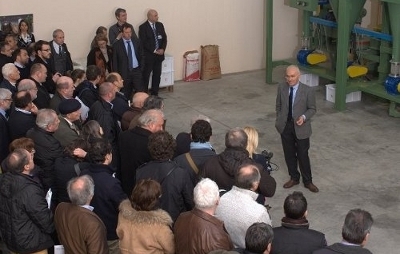 On March 16th 2011, BioHyst offered to the media, to institutions and companies an in situ demonstration of the workings of his technology: the Italian answer to key issues such as food shortage, alternative energies and the environment. The meeting was organized by the BioHyst company together with the Association Scienza per Amore (Science for Love) and provided the occasion to directly verify the scope of the results described on March 2nd 2011 in Rome, during the official presentation of the humanitarian project “Bits of Future: food for all“. Present at the demonstration were representatives of the Embassies of Mauritania, Burkina Faso, Ivory Coast, Ghana, Somalia and Senegal, representatives of IFAD and of several important companies operating in both food and energy sectors. The technical demo enabled those present to observe first hand the efficacy of Hyst technology in processing bran and biomass waste such as straw – aimed at producing food and feed with high nutritional values, with extremely reduced energy consumptions and zero environmental impact. Two different processes were performed during the demonstration. In the first, soft wheat bran was processed. This produced a food flour with a high content of proteins, vitamins (A, B-group, E) and minerals which is particularly suitable for uses in situations of undernutrition and malnutrition. The second processed common cereal straw and obtained a fraction with characteristics similar to those of top quality hay. Operations were supervised by an appointee of the Department of Animal Sciences, University of Milan, who will carry out analyses and publish the results. Samples of the products were made available for anyone who wished to take them and conduct their own analyses.